Bali is a world class tourist destination since the 10 decades ago. There are many reasons why so many people vacation in this tropical island. They visited Bali to enjoy the beauty of nature, art and culture or honeymoon. 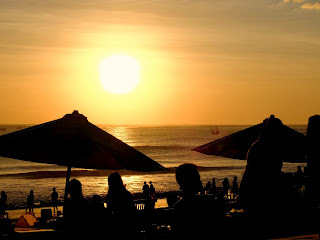 Since the past 10 years, Bali is also famous for convention tourism, fashion, and other unique activities. Island of the Gods is also known for its friendly residents, creative, hardworking and open to foreigners. The majority of people in Bali are Hindus, but they are very tolerant and live peacefully with adherents of other religions. In addition to the reasons mentioned above, the rating is also the visitors who want to escape from the bustle of the big city or a business and jobs that make them stressed. Bali is apt to learn yoga or learn to cook, you can even learn to dance, sculpture and other art activities. Even you can calm yourself, such spiritual counseling as practiced by Elizabeth Gilbert, please buy the DVD or Blu-Ray entitled "Eat Pray Love", a film starring Julia Roberts. Suppose you have only the excuse of being tired or stressed, then Bali is a very great place to release your stress. This is also done by Mukidi, a character who is very famous in Indonesia. Mukidi has become the subject of conversation users of social media like WhatsApp, Twitter or Facebook, even have made several videos uploaded to YouTube. One of them is Mukidi holiday to Bali. According to his close friend, Mukidi holiday to Bali because of the stress caused by a variety of jokes, memes and videos of Mukidi in social media. Let's watch this incredible video, which perhaps will inspire you to choose a vacation to Bali in the near future. Are you ready for a real holiday and adventure? Let's go to Bali and enjoy the best moment in paradise.